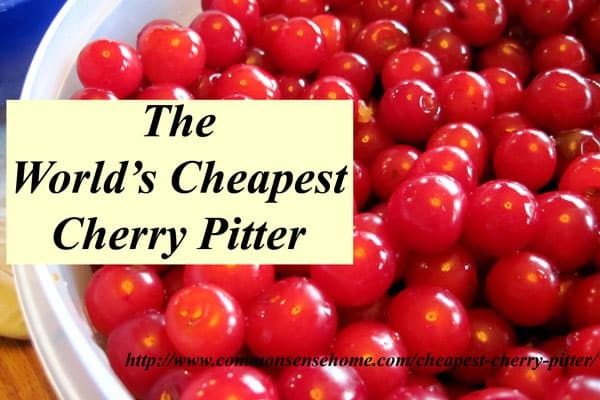 We live in northeast Wisconsin, just minutes away from the Door County peninsula, where you'll find one of the biggest tart cherry producing areas in the U. S. We usually go picking and fill the freezer every two years. Our favorite cherry picking spot – Cherry Lane Orchard – has a deal where you get the seventh bucket free if you pick six, which is a LOT of cherries. We stocked up last year, but we had family visiting this year who wanted to go picking, so we headed up yesterday. 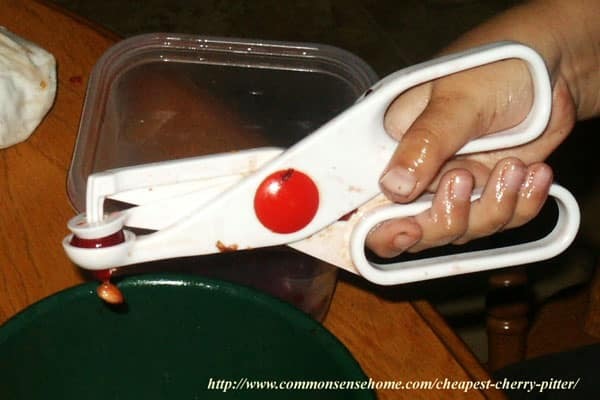 I was talking to my niece about how to pit the cherries, and she had never heard of the method we use. This was passed down to us with much ceremony the first year we went cherry picking, back in the 1990's. We had my mom and nephew with us, and had picked a whole mess of cherries – two five gallon buckets of them. As we were paying the bill, the orchard owner asked how we were going to pit them. Never having picked before, we had no idea. (Worry about it later, right?) She leaned in close, and told us she would share the secret of the world's cheapest cherry pitter. Then she grabbed a paperclip off the desk, unfolded it, and proceeded to demonstrate how to quickly and easily pit a big pile of cherries. We've used the method ever since for the bulk of the cherries we process. We did get a couple of other pitters for the boys to use, as much as to keep them interested in the pitting process as anything else – boys like gadgets, and paper clips are not terribly exciting. I'll show those a little later in the post. So – without further ado, a quick video on how to use a paper clip to pit a cherry. Ta-da! Many people use a hair pin in the same way, but today's hair pins are often made quite cheaply and the coating comes off. Here are the other options to keep the boys entertained while pitting. Cooks Illustrated liked the Prepworks From Progressive International Cherry-It Multiple Cherry Pitter/Slicer, which looks like a stapler and pits four cherries at once. My friend, Laura, who lives in the heart of Michigan cherry country, recommends the Leifheit 37200 Cherrymat Cherrystone Remover, which is a plunger type with a bin below to catch the pits. Once our own cherry trees start producing, I may invest in a higher volume pitter, but for now, the simple paper clip solution works just fine. 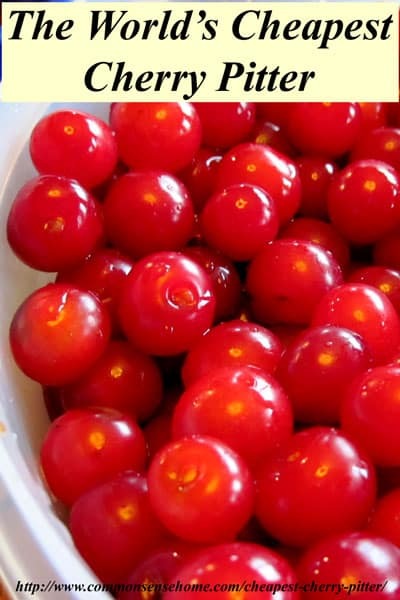 We just picked cherries from our cherry tree last week and I was thinking how it’s a pain to get rid of the pits. Thanks for the tips. Do you put the paperclip through the top or bottom, or does it not matter? I usually go right in the stem hole, which is naturally open on tart cherries. I look forward to reading and watching more of your posts. Thank you so much for this post! I was in much the same situation you were in the 90’s, but now I have 7 lbs. of cherries in my freezer, and no idea how to pit them all. I knew I couldn’t afford a real pitter. Thank you so very much for this practical, money saving tip! Now I just have to buy some paperclips, as it seems even my junk drawer doesn’t contain one! Glad to be of help. I’ve never tried thawed cherries, but it should work. My mom’s from the Thumb of Michigan, and she has always used the paper clip method for pitting. In fact, because we always had a lot to do and your fingers could get tired of holding the clip, she just rubber-banded the end you weren’t using to pit the cherries to the bottom of half of a wooden clothespin. Sped things up nicely! Not sure where this information came about a paper clip, but it was not from Cherry Lane Orchards. Our preferred method is on our website. (cont.) a good video presentation though! 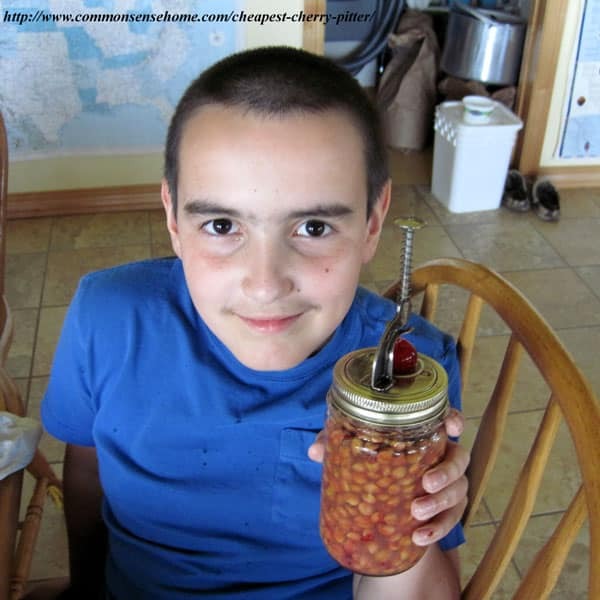 Each person finds their preferred method for those delicious Door County Cherries. Just got an awesome cherry pitter at Walmart in the produce department. It was only $6, and pits 6 cherries at once!! What a great tutorial. This is one of the best life hacks ever! Thank you! Thank you! Thank you! Thanks, Joann. Is it cherry season in your area? Arrg! Where were you last week when I needed you?! I pitted about 10 half pints worth using the stapler type. The biggest problem with this is that it doesn’t always (as in MOST of the time) pop the pit out. My mom used to have one that had a sort of a plunger motion, with a chute for the cherries and a container for the pits. Oh well, I still have several pounds that I will use a paper clip on. Thanks for the demo! Yes, we’ve found paper clips to be more reliable at getting the pit out, too, compared to the staple type pitters. Thank you so much for posting the recipe of Old Fashion Rhubarb Pudding. As a kid my mom used rhubarb so many ways even eating it raw. To sour for me but one of my daughters loves it raw. Wish I had some of those old recipes as they have now been lost. I love old cookbooks and recipes. It’s like stepping back in time. Have you tried this with sweet cherries? Thanks for the great demonstration! It doesn’t work quite as well with sweet cherries, unless they are very ripe so that the stone releases without a lot of effort.